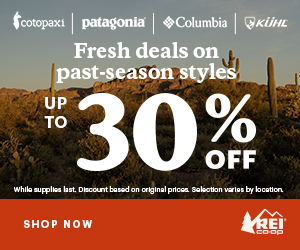 As we approach the middle of summer, it’s a great time for hiking the PCT in Oregon. 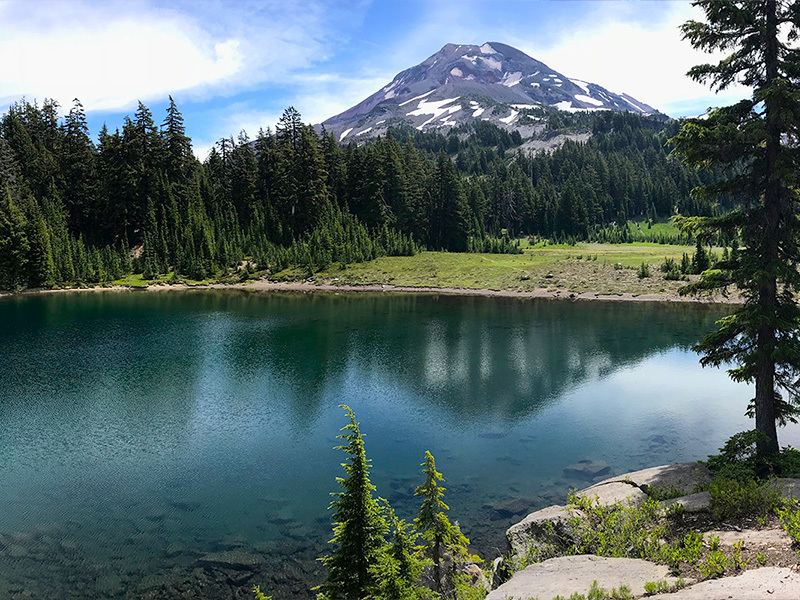 Wildflowers are going crazy, water sources are still (mostly) plentiful, weather is mild and sunny, bugs are on the decline, and—knocking wood—the entire trail thru Oregon is open and wildfire-free. 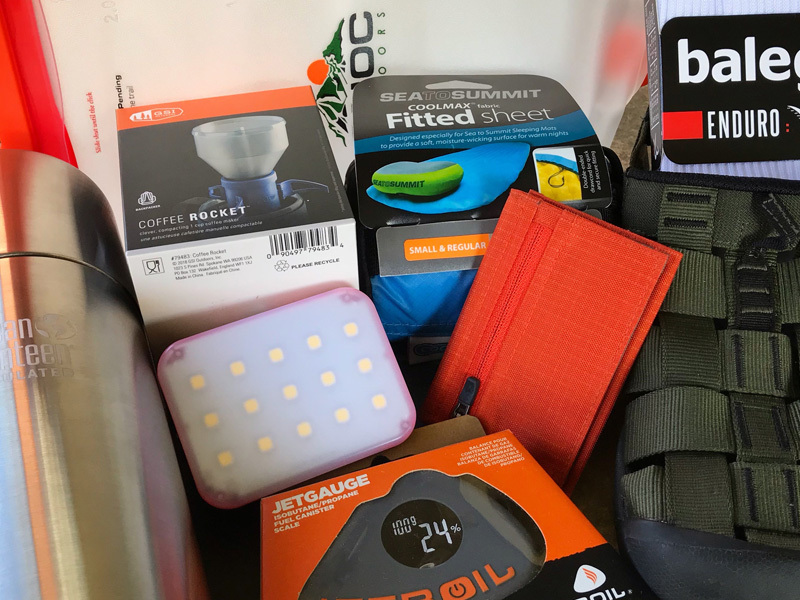 * Following our 3-week survey of the southern and central regions of the state, we’ll be working up some detailed updates on trail conditions and changes to supplement the PCT: OR guidebook. Look for those to come soon. In the meantime, here’s the latest on conditions across the state. Happy hiking! 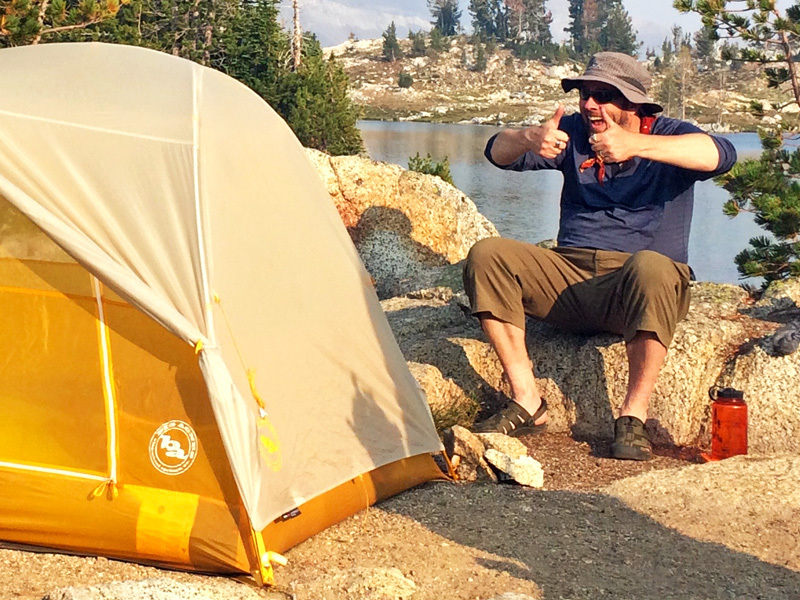 July on the PCT was absolutely miserable due to the gazillions of mosquitoes plaguing Oregon’s forests and lake basins. 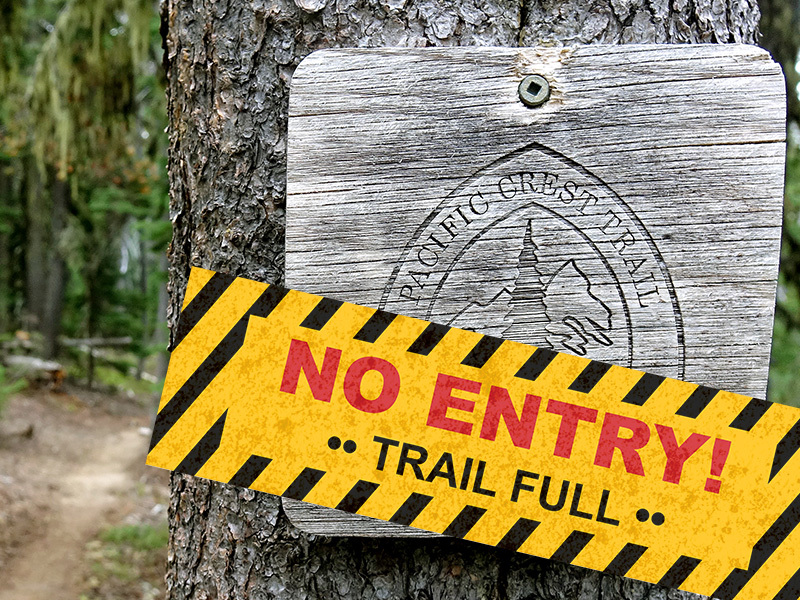 We met several hikers—including thru-hikers—who were so frustrated by the incessant buggers that they had to bail off the trail to preserve their sanity. The good news is that the little @#$%&s are finally on the decline and the trail environment is becoming more tolerable. As summer wears on, they will continue to diminish and we can look forward to peaceful, unmolested trekking. This week, temps across Oregon’s Crest will be easing off a bit. Look for daytime highs to start dipping thru the 60s and into the 50s by the end of the week; overnights will be chilly heading into the 40s. Skies will be mostly sunny in most regions, except for the southern regions where several wildfires are contributing to smokey and hazy conditions. Next week, temps will start inching back up into the 70s. For area-specific weather reports, click on over to our conditions page and click on the weather icons to search for the latest regional forecasts. 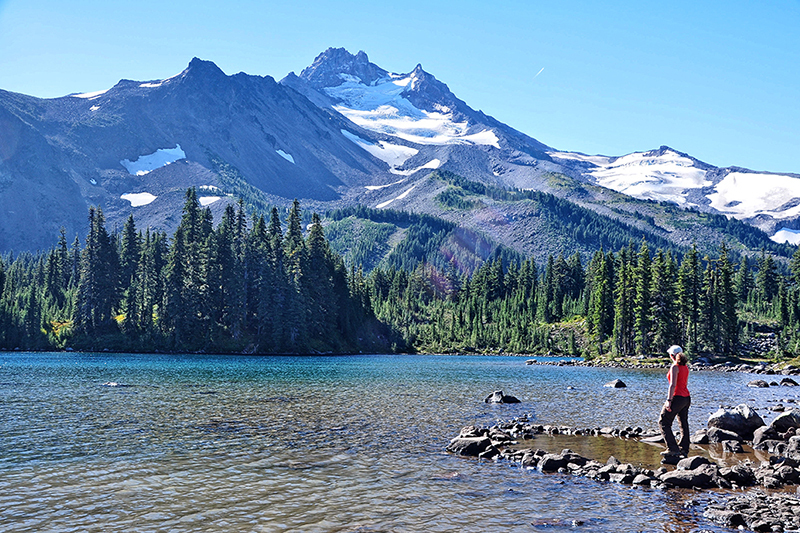 Creeks, Springs & Lakes: Most of these water sources remain reliable, with the best options at any of the larger lakes and ponds on or near the trail. Most springs and smaller creeks have some water, though recent reports indicate that these are beginning to dwindle. Honeymoon Creek is dry (HM 1802.1); Six Horse Spring is a trickle, so proceed below the stagnant pools (HM 1872.1+0.5). Pumps & Faucets: The pump at Brown Mtn Shelter has been fixed and is usable (HM 1763.3). The faucet at Hyatt Lake has been turned off (HM 1742.8). Click here for the full Oregon Water Report. 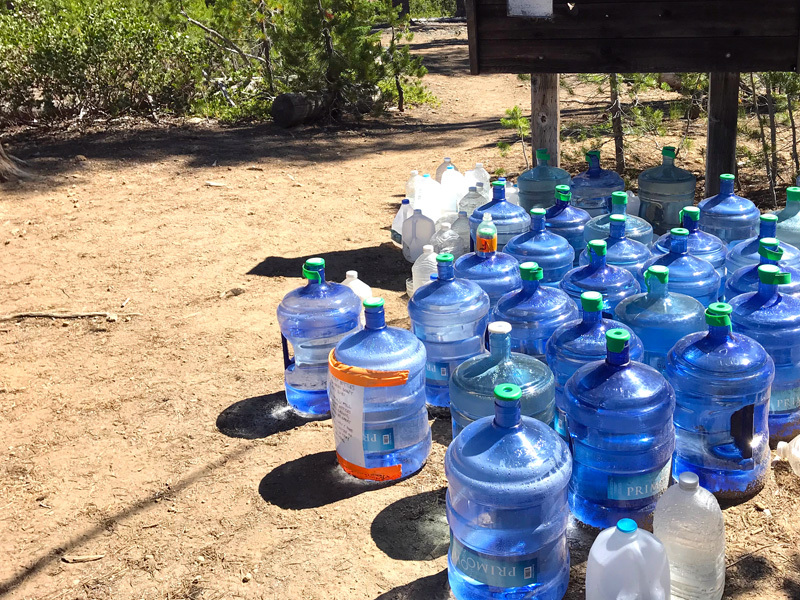 Water Caches: Hiker reports as recent as last week indicate that caches at Red Cone TH (CLNP; HM 1839.2), Thielsen Wilderness Boundary (HM 1848.4), and Windigo Pass (HM 1878.3) still have water available. This could change at any time depending on the number of hikers passing thru. 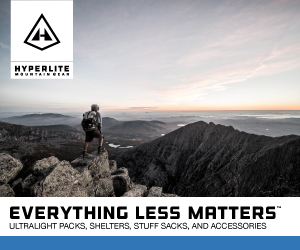 It’s best not to rely on caches and be prepared by carrying a little extra. There are several wildfires burning near the PCT in southern Oregon, but no closures are currently in effect. A few small closures were enacted last month, but those have been lifted. Currently, the entire PCT thru Oregon is open and hikeable, with the exception of a short section in CLNP; see below. For the latest up-to-date fire info in Oregon, visit InciWeb. 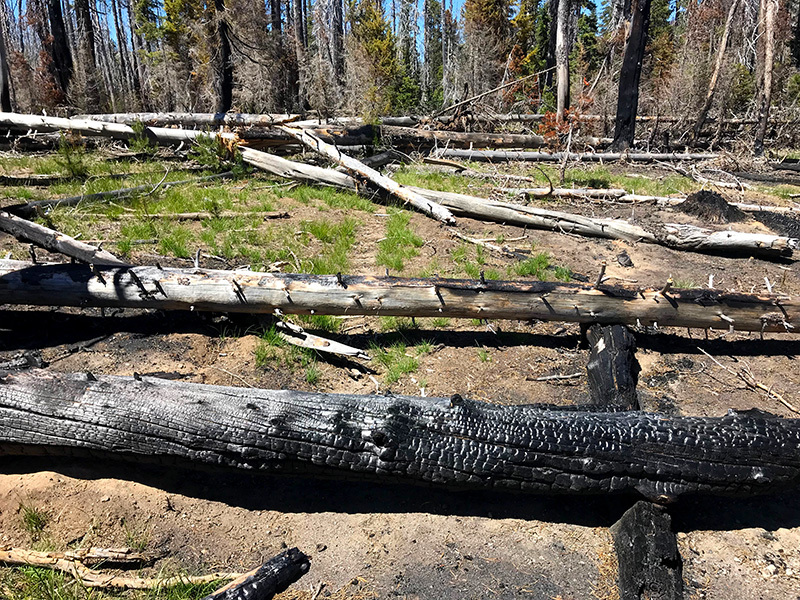 Recent burn areas are littered with downed trees and debris, like this stretch of trail in the Oregon Desert. 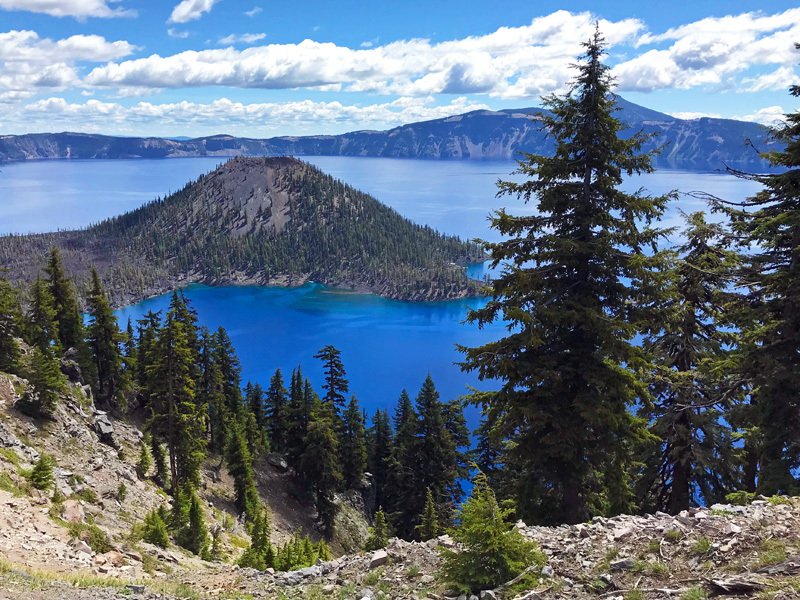 Take in this view of Crater Lake's Wizard Island from the Rim Trail. Volunteer-maintained water caches are a much-appreciated form of trail magic. 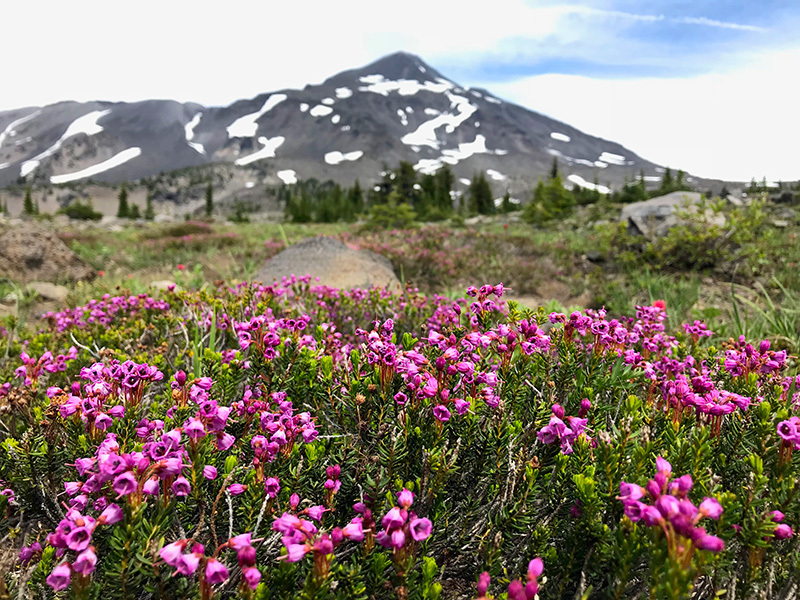 Summer brings wildflowers to Oregon's wilderness areas, like this heather in the Three Sisters area. First, thank you for all you do to help maintain the PCT. My friend and I have been section hiking the PCT starting at CA/OR boarder to Crater Lake. My friend is fighting terminal metastatic breast cancer and is taking chemo medication. This year we hope to finish, getting back on trail at Hwy 140 ending at Crater Lake. We can only hike 6-7 miles a day due to fatigue from the chemo. Your book makes it possible for us to figure out our camps for each day. Your recent blog states that last years fire has caused a lot of damage to the PCT on section 2 between miles 33-44. We have planned to camp at camp 14 and then camp 15. My question is, do you know if camp 15 is still an option? Again thank you for everything you do to help. Your book is known, in my house, as the Bible. I can quote you on all the sections we have hiked and plan to hike. When talking about our hike, I say Eli says. Thanks so much for your heartfelt message. It’s not about how far or how fast you hike. 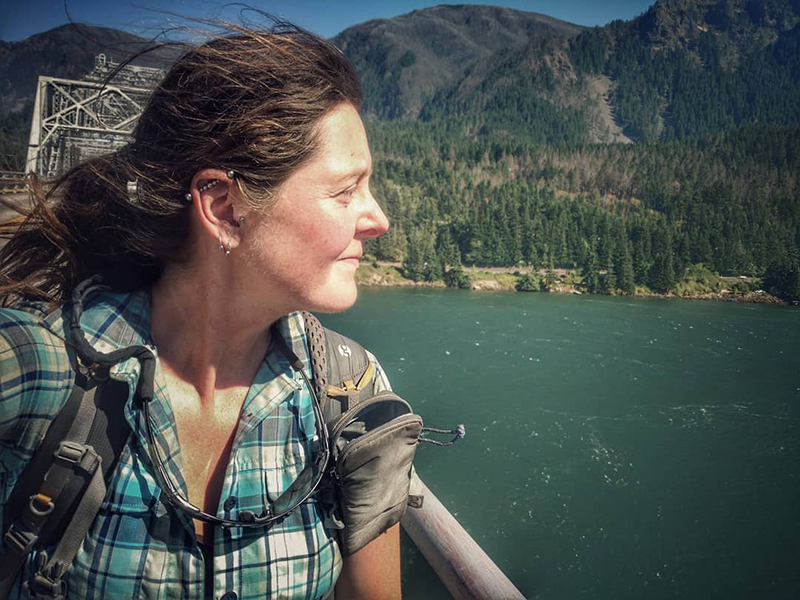 It’s about getting out there and hiking the PCT in a way that works for you. And that’s exactly why we wrote these guides. 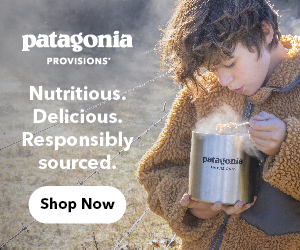 I’m glad you’re finding it so useful for tailoring your hike. Yes, Section 2 was heavily damaged in last year’s fires. 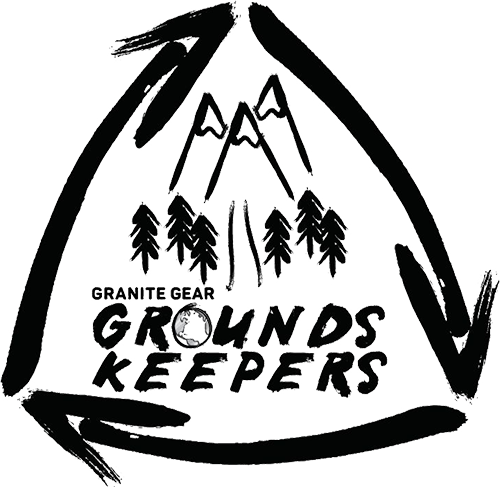 We hiked thru that area last month and posted some updated conditions (see here). Camp 15 was toasted pretty good, so is not recommended any longer. 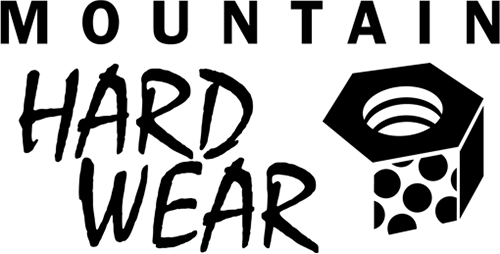 You can proceed approx. 0.5 mile farther to a nice spot in an island of unburned trees where the trail crosses a low ridge. Good luck out there. Cheers! 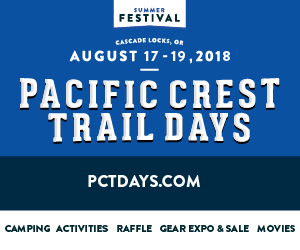 Thank you for your information, again you have made our PCT planning much easier!